If you had believed all the advance publicity put out by the AC de l'Ouest, the 1976 edition of the 24-Hours of Le Mans was going to be the most dazzling, original, different looking Le Mans in history. Somehow the race on June 12th/13th didn't work out quite like that, for it was still in essence an event dominated by a handful of very fast sports-racing cars backed up by a large supporting cast of GT and touring cars from the workshops of Porsche and BMW. Yet the organisers had given some welcome thought to brightening-up the image of their race, which had dimmed and tarnished somewhat in recent years as fewer factories, and fewer still Grand Prix drivers, included the race in their competition programmes. Frightened by the relatively poor attendance for last year's race, the ACO had therefore brought in a number of innovations to add a little more sparkle to the gruelling test of endurance round the 13.64 km. Circuit of the Sarthe. The regulations were liberalised to bring in a wider variety of cars than ever before, the organisers audaciously ignoring the FIA's directive that Gp. 6 cars could not be mixed with production based machinery if the race was to stay in either of the two long-distance World Championships. 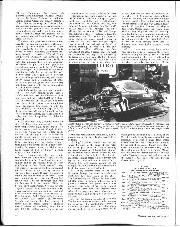 An invitation was sent to America to bring over a handful of the cumbersome NASCAR stock cars that are more used to pounding round all-banked ovals and for the "All American" GT cars that are governed by the rules of the International Motorsport Association. Yes, despite all these innovations, the entry had the traditional composition of Group 6 sports-racing cars (the FIA has stopped calling them prototypes at last, preferring the more accurate description of "two-seater racing cars"), Group 5 "Silhouette" cars, and Group 4 CT machines. 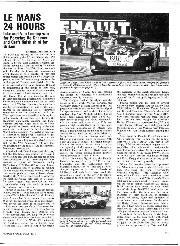 But by insisting on running the one major long-distance event of the year that would pitch all these different classes together, the ACO has succeeded in gathering the most interesting field seen at Le Mans for some seasons, and certainly the most representative entry that would be seen for an endurance race this year. Fastest in practice, by more than six seconds in fact, was the Alpine Renault A442 shared by Jean-Pierre Jabouille and Patrick Tambay. Rene Amoux had been nominated as reserve pilot for this car, but when the young Frenchman proved too small to fit snugly into its cockpit, team manager Gerard Larrousse had to call instead on one of his second-string Formula Two drivers, Jose Dolhem. The 2-litre, turbocharged, 500 b.h.p. V6 A442 was almost unchanged from the form in which it has appeared in the World Championship for Sportscars except for a longer, more streamlined tail. Jabouille lapped the circuit during practice in 3 mm. 33.1 sec., making the French, Elf-sponsored car comfortably quickest of the Gp. 6 entries.